xcweather promised, according to the little sparkly sun icons, that the day would would be filled with beating sunbeams suspended in an azure sky. they were, of course, rather wide of the mark. the website has its uses if employed to gauge the ferocity of the wind, but tends to leave a bit to be desired as to its accuracy in other ways. no never mind, it would simply mean long sleeves as opposed to layers of factor 50. it would be unfair, however, to single out xcweather, as the twerps voicing the today show on radio four paid witness to only 'overcast in the south, breezy and showers elsewhere', a phrase so unspecific in its determinants as to be utterly pointless. road signs at crosshouses promise roadworks from 14th june, and though similar signs promise likewise on the high road, over four miles away, from the same date, it seemed prudent to experience the road as it is, in anticipation of what it might end up after the 14th of june. surface dressing, with its similarity to a destructive apple crumble, is never favourable to those on two wheels. propping frequent signs advising a 10mph speed limit at the roadside is ample evidence that nobody pays any attention to signs, especially if they concern speeds that ought to be observed by motorists. i have previously mentioned that there is a road or two saved purely for special occasions, those for when a review bicycle, wheels or tyres seem to promise exceptional behaviour. subjecting them to such specialities may hopefully allow them to show their true colours. the three miles of farm road rising up past west carrabus farm to the former cottage at borraichill are, to put not too fine a point on it, crap. descending and twisting to coullabus they become even crapper over each successive metre. this is one such road. in fact, it is the premier travesty to which any bicycle componentry can be exposed. the downhill from the cottage resembles nothing so concrete as a road, and the likelihood of meeting the resident herd of cows in the middle of it, simply adds to the frisson and the squealing of brakes. there was a click. if i'm totally honest, it was more of a rapid burst of clicks that could just as easily have combined to form a creak. distinguishing the cause was placed in a clouded perspective by sympathetic creaks from the brooks saddle. the latter however, were more benign in character, the result of lacking tension on the saddle bolt. i can blame no other than myself. the clicks played around the bottom bracket and had been, i thought, narrowed down to the five chainring bolts, several of which had proved slightly loose on a previous ride. those had been severely tightened with a park tool 5mm allen key, even the two that rotated more freely than their siblings. a squish of gt85 had confidently removed any premise or forethought of creaking, yet here i was, only a mere handful of metres from home, and the click that was really a creak had returned with venom. en-route to the carrabus road, climbing was done in and out of the saddle in an attempt to isolate the problem, accompanied by one or two stops to footer with an allen key and crank bolts. it seemed that effective repair, even though irritation was the principal casualty, would have to wait until home time. meanwhile i stoically forged on across islay's roads' department's tip to the third world, mentally picturing a cheese and apple chutney roll sitting aside a frothy soya cappuccino. a man has to have some objective in mind to stave off adversity. that road well travelled, if not well maintained, dips at keeper's cottage before rising sharply to the coullabus farm entrance. 'tis but a few metres to the road junction at which a left takes me in the direction of uiskentuie farm three miles away. just ahead were two cycle tourists, the guy riding alternately alongside his female partner then behind, towing a small bob-trailer with one of those triangular flags announcing its existence to vehicles that may approach too closely. i had by now ascertained that the creaking seemed to rely on left crank pressure; it clicked loudly as that foot descended roadwards. one likes to demonstrate one's benevolent insouciance when passing visiting cyclists, travelling just speedily enough to show my mettle, but not too fast in order to minimise any perceived arrogance. both the foregoing would obviously be severely diminished were a loud creaking to drown out my passing salutations, so i lightened up as much as possible with the left leg as i sailed past, at which point the firmament chose to smile upon my cheerful hello; the creak disappeared. many of you will have been in just such a situation, when an irritation seems to have disappeared for good, only to be found hiding behind a chainstay or fork leg. yet my trials and tribulations across the grass and dunes of uiskentuie strand betrayed no resurgence of the problem, which truly had fled for pastures new. it is at times such as these that one becomes classically aware that the choice of pedal wear may have been a tad more apt than had seemed to be the case at point of departure. for through all the faffing, dismounting and remounting, clothing obliviousness remained thus. though the specific definiton of the word classic resounds to the perfect example of a particular style, it is a word or adjective that brings its own connotations dependent on the circumstances of the day. it would not be too unseemly to refrain from giving the classic nod to an unspecified item if it is brand new and modern, for many amongst us, self included, may prefer to reserve the description for an item that has, over time, proved its initial worth despite a lack of alteration to the concept as time has rolled by. 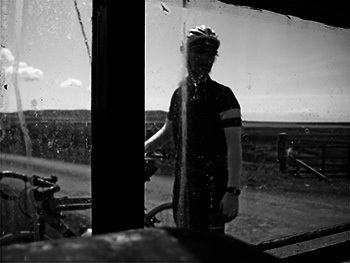 rapha are rapidly approaching their eighth anniversary, the first product having made itself known in july of 2004. it is testament to their appreciation of longevity that they still, to this day, offer the classic jersey and classic bibshorts, virtually unchanged across those eight years. i feel confident in saying almost because i now ride in a pair of new classic bibshorts. these have eschewed the nalini pettachi pad that cossetted my bum for over four and a half years of constant use before the lycra said 'enough. 'in fact, the pettachi pad lasted only a brief moment of time in the rapha empyrean, as it seems many was the bum that found no favour with it. mine was not amongst them. however, though the classic jersey can be had only in traditional black with the all-important white monogrammed hoop on the left (short) sleeve, the classic bibs have developed a split personality in offering all-black, or black with cream bibs. 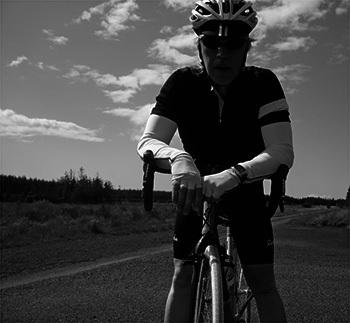 as rapha's graeme raeburn said "The new cream colour is perfect for this fantastic weather; no more black mesh show-through on light coloured jerseys. ", which comprehensively explains why the little black dress nabbed some invisible cream. what has not changed, insofar as my perceived comfort is concerned, is precisely that. thewashingmachinepost bottom has experienced more than just a few pairs of bib shorts in its unassuming career, many of which have promised much and delivered accordingly, but you never forget your first pair of classic bibshorts, a garment which surely inhabits every last definition, nook and cranny of the word classic. 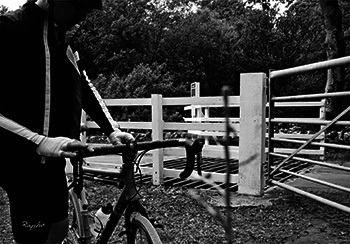 while creaks, clicks and the occasional groan seem to come and go at will, even on passing the well-travelled, a classic pair of bibshorts with the added ability to conceal themselves when worn with white are of perennial delight. shiny lycra may be all the rage in the peloton, set to provide an infectious gleam to applied sponsors' logos. 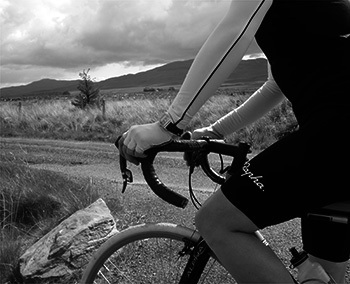 rapha's classic bibshorts have a matt tactile quality that has no real bearing on saddle comfort, but a sartorial elegance that is hard to avoid even on the dishevelled. as i recall, my original classic shorts had a hard to find, black on black logo; modern times call for modern effect, and the black lycra now springs its contrast to the tune of a white rapha logo on each leg. the ideal length of each leg is held comfortably in place by a thin internal film of silicon gloop, that despite many an extra-curricular excursion in the chase of creaking bicycle parts, coupled to eccentric pedalling in the attempt to isolate the problem, the only item moving every which way was the rider. 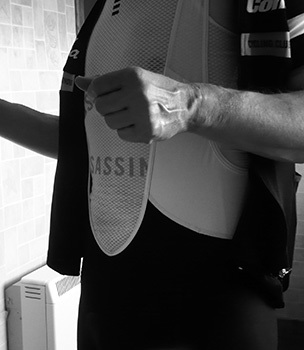 the bibs, just before they meet the mesh, feel like silk. it transpires, however, that you need not simply take my word for it in this case. 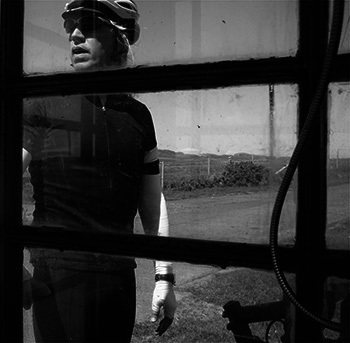 so confident are perren street that these will not be found wanting, that they offer a thirty day opportunity to ride either or both the classic bibshorts and classic jersey to destruction, and if your satisfaction does not reach that of my or your own 100%, you can return them for a full refund.